With Gustav Vigeland's famous statues, the park shows Gustav Vigeland's portrayal of human life from beginning to end. The most famous statues in the park are the "Sinnataggen" which is in the middle of the bridge and Monolith, which is the end of the park. The monolith is impressive in size and did you know it was cut out of a single piece of stone? Frognerparken also contains Frognerbadet with 4 outdoor swimming pool, steeple and water slide. 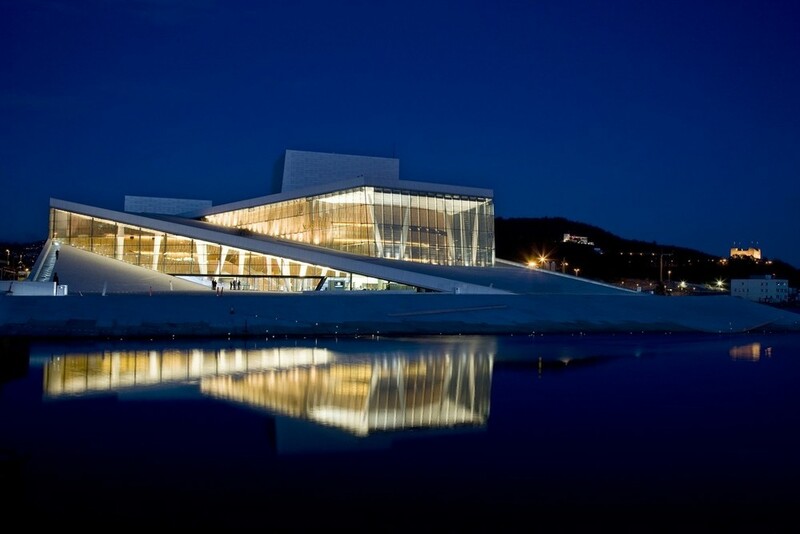 Oslo Opera House was opened April 12th 2008 and was designed by Snøhetta. Many people come to the opera to enjoy the architecture or the building's two restaurants, Brasserie Sanguine and Argent Fine Dining. The Opera's location in Bjørvika makes it easy to visit for anyone arriving / traveling from Oslo Central Station. With its amazing view of Oslo, Holmenkollen is well worth a visit when in Oslo. Do you want to jump in Holmenkollen? Try the ski simulator where you "jump" in Holmenkollen and drive Super G. Or visit the cafe and museum shop for a coffee or a cozy souvenir from your visit to the capital. In winter this is Oslo's best toboggan run, with a café and a sled rental, everyone can enjoy the pleasure and the speed of a trip down the hill. This amazing building has protected Oslo since about year 1299, and today houses the Defense Museum, Norway's Home Museum and Akershus Castle. Come inside and learn about Norway's history or just to see the fortress and wander around in this historic building. Great restaurants, shopping and cafes are some of the things that attract people to Aker Brygge summer and winter. Also visit Tjuvholmen with the Astrup Fearnley Museum or just enjoy the architecture. Bygdøy is known for its museums but also for its residental area.Take the boat over the fjord in the summer or bus no. 30 in the winter and visit the different museums or walk in the streets and have a look of the wonderful houses. Muesums worth a visit are the Norwegian Folk Museum, Kon-Tiki Museum, Fram Museum and Viking Ship Museum. Here you will find information about peace prize winners, Alfred Nobel and international peace efforts. The Center offers an exciting and educational visit for adults and children. Here you can see many of Edvard Munch's artwork! Please visit: www.munch.museum.no to see what exhibitions the museum offers. When you are at Tøyen we can also recommend a visit to the botanical garden or the Museum of Natural History. Of Oslo's smaller museums we can mention: Historical Museum, Stenersen Museum, Ibsen Museum. Film Museum and Museum of Contemporary Art. Or visit Oslo reptile park or The mini bottle gallery. Please visit http://www.visitoslo.com/en/whats-on/events/ to see if there are any happening the days you spend in Oslo!